The National Historical Commission of the Philippines (NHCP) has to impose sanctions against Filipino athletes who wore uniforms with the logo of Philippine flag in reverse position that occurred during the South East Asian Games. Inverted Philippine flag where red is over the blue color symbolizes war, bloodshed, and chaos. Many netizens noticed the unreasonable approach after Filipino athletes win three gold medals. These Filipino athletes will be penalize while they already put themselves into the center of criticism. 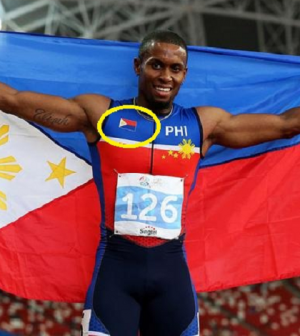 The Philippine Athletic Track Field Association made their apology saying that the inverted Philippine Flag is a supplier error which they corrected. They also waiting for the supplier to publicly explain this lapse. It is written in the Republic Act 8491 (Flag and Heraldic code of the Philippines) that whoever commit the said violation of such legislation will pay P5,000 to P20,000 fine and punishable by one year imprisonment. Looking for something? Check inside...! Thank you for reading Three Pinoy Gold-Medalist to Face Lawsuit Against Wearing Inverted Philippine Flag posted on the website Kwentology if you want to redistribute this article please include the link as the source. Have some kuwento to share? Contact us!